By default your website uses the Open Sans typeface or font (find out more here ) which, according to Google, is “optimized for legibility across print, web, and mobile interfaces”. You can however change your website’s typeface if you wish, as well as the size of the wording – Font size – very easily using the Theme Customiser. In the WordPress Dashboard go to Appearance / Customise / Typography / Body. By default Font family is set at Open Sans. Select a different font from the list – the website preview on the right will show what the new font looks like. Further down you can set the Font size to the desired size. Changing the Body Font family will change the font on the entire site, including the menus, widgets etc as these elements inherit the Body Font family. If you wish to keep Open Sans in the main menu for example go to Appearance / Customise / Typography / Primary Navigation and Select Open Sans instead of inherit in the Font Family. Changing the Body Font size will only change the Font size on your pages, not on your widgets. To change your widgets’ Font size go to Appearance / Customise / Typography / Widgets / Content font size. Click the blue Save & Publish to save the changes you have made to your website in the Customiser. 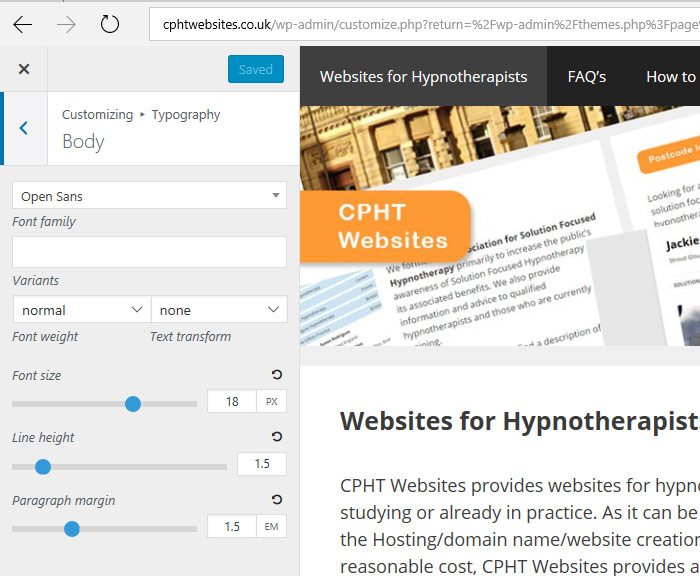 Lastly, always use the Customiser to change Font Family / Size on your website’s pages rather than individually editing pages in Edit Page mode. Otherwise if one day you decide to change your website’s font size or family you will have to edit all your pages individually.